Osteoporosis is a skeletal disorder characterized by loss of bone mass, reduced bone mineral density, and deterioration of bone microarchitecture, which lead to bone fragility. Bisphosphonates that are currently approved by the FDA for the prevention or treatment (or both) of osteoporosis include alendronate, ibandronate, risedronate, and zoledronic acid. This review discusses the rationale for treatment with bisphosphonates in patients with osteoporosis and osteopenia, focusing on the associated benefits and risks. Bisphosphonates bind at the bone mineral surface, where they potently inhibit osteoclast mediated bone resorption, and subsequently embed in the bone, being released only during subsequent resorption. Bisphosphonates with the greatest binding affinity to bone (zoledronic acid > alendronate > ibandronate > risedronate) may persist in bone, and patients continue to be exposed to the pharmacologic effects of these drugs several years after discontinuation. After intravenous administration of bisphosphonates skeletal uptake is rapid and most of the drug that is not excreted in the urine within 24 hours is bound to bone. Intravenous administration of a single 5 mg dose of zoledronic acid decreases bone resorption for as long as five years. Daily oral administration of bisphosphonates suppresses bone resorption to a nadir as quickly as three months after the start of treatment, and treatment is associated with an increase in bone mineral density (BMD) as early as three months after initiation. 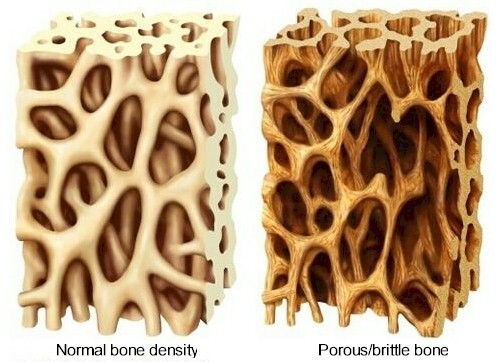 All bisphosphonates rapidly reduce bone resorption, which leads to decreased bone formation. Within three to six months equilibrium is reached at a lower rate of bone turnover. The end result is preservation or improvement in bone mass and microarchitecture, which leads to a reduced risk of fracture as early as six months after administration. A meta-analysis published in 2014 reported high quality evidence that bisphosphonates reduce fractures compared with placebo in postmenopausal women, with relative risks in the range of 0.4 to 0.6 for vertebral fractures and 0.6 to 0.8 for non-vertebral fractures. Although bisphosphonates differ pharmacologically, no convincing comparative effectiveness data are available to conclude superiority of any one bisphosphonate. A number of adverse effects are associated with the use of bisphosphonates. Gastrointestinal side effects, including esophageal irritation, dysphagia, and heartburn, are well known for all oral bisphosphonates and represent a potential barrier to tolerance and adherence. Intravenous administration of bisphosphonates has been associated with transient mild to moderate inflammatory symptoms, such as fever, myalgia, arthralgias, and headache, collectively known as an acute phase response. These symptoms occur in 12-42% of patients within 72 hours of the first infusion, resolve within one to four days, and are less likely to occur after subsequent infusions. Bisphosphonates reduce calcium efflux from bone by inhibiting osteoclastic bone resorption. This can cause a small, clinically unimportant, decrease in serum calcium as long as baseline serum calcium is normal. Osteonecrosis of the jaw (ONJ) has emerged as a rare complication of bisphosphonate use and can be associated with substantial morbidity. A study of more than one million women reported that the incidence rate of atypical femur fractures increased from 1.78 per 100 000 in women receiving bisphosphonates for less than two years to more than 100 per 100 000 in those receiving bisphosphonates for eight years, suggesting that longer bisphosphonates use increases the risk. Bisphosphonates have been associated with uveitis, conjunctivitis, episcleritis, and scleritis. A prospective study reported a 1.1% incidence of uveitis after intravenous zoledronic acid, which is thought to be part of the acute phase reaction. Because of the weight of evidence supporting their clinical efficacy, bisphosphonates are considered first line therapy in the treatment of osteoporosis. Randomized trials have shown that bisphosphonates prevent osteoporotic fractures in selected patients. Data from the pivotal trials showed benefit in preventing clinical fractures only in patients with previous vertebral or hip fracture or a hip BMD T score of −2.5 or less. Bisphosphonates are approved by the FDA for preventing osteoporosis in menopausal women, but it is not known whether their use decreases the risk of fractures. For those considering bisphosphonates for prevention of bone loss that is independent of the risk of fracture, bone turnover markers could predict the rapidity of bone loss. It has been suggested that bone turnover markers should also be monitored when assessing treatment efficacy and patient adherence to bisphosphonates; however, data are inconsistent. Non-adherence with drug treatment is a problem: about half of patients prescribed with oral bisphosphonates discontinue treatment within one year. The optimal duration of treatment and the impact of drug holidays in mitigating the risks associated with long term use of bisphosphonates are both unclear. After starting bisphosphonates, changes can occur that affect the benefits versus risks of continuing treatment. These include changes in patients’ characteristics as they get older, the biology of the underlying disease, the degree to which continued treatment modifies the risk of fracture, and the cumulative risk of the adverse effects of therapy. These changes should be taken into consideration when deciding on whether to stop or continue treatment. Also, the decisions about drug holidays need to be based on the individual characteristics. Finally, effective communication between clinicians and patients about the use of bisphosphonates is essential throughout the management of osteoporosis. Maraka S and Kennel KA (2015) Bisphosphonates for the prevention and treatment of osteoporosis. BMJ 351, h3783.